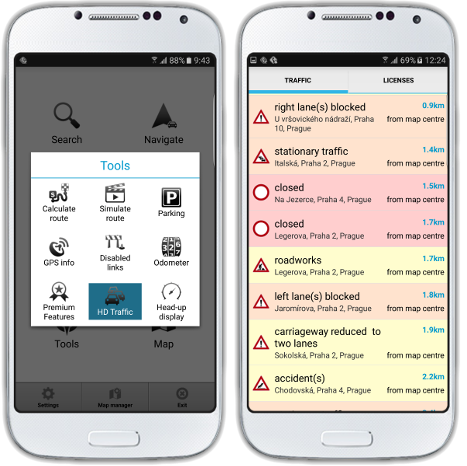 HD traffic has been introduced in Navigator 3.0 released in April 2017. HD traffic offers live traffic information that is displayed on the map and used for route calculation and optimisation. A list of current traffic restrictions is available in Tools / HD traffic / Traffic. The list is sorted by distance from the map centre. If you tap on a restriction in the list, you can display it on the map. If there is a new major delay along your route, Navigator will automatically recalculate it to save you time and help you get to your destination more quickly. To set up HD traffic go to Settings / Navigation / HD traffic. How to get HD traffic? 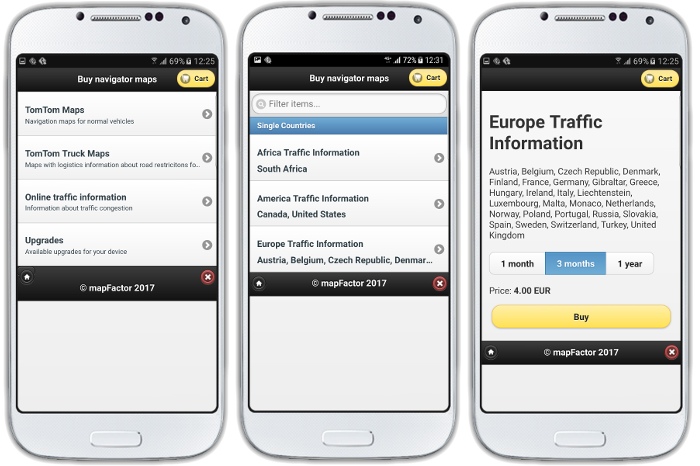 Live HD traffic feature is available as an in-app purchase for Navigator 3.0 and higher (Map Manager / Buy Maps / Online traffic information) for region and for a period of 1 month (2 EUR), 3 months (4 EUR) or 1 year (9 EUR). Further information on the mapFactor GPS Navigation 3.0.